Krakow is the second largest city in Poland. It is a very important place for me for two reasons. First, it is where my mom was born and where my maternal family still lives. All my life I have always been spending a month every year in Krakow visiting family (my parents’ annual leave, basically). Second, I have lived in Krakow myself for two years and a few months, between 2012 and 2014. Over those two years I got to explore the city much more than I did as a kid and found a few places I like to back go to whenever I come back. When I visited Krakow for the Christmas holidays I decided to pay a visit to some of those favourite places of mine and write about them. 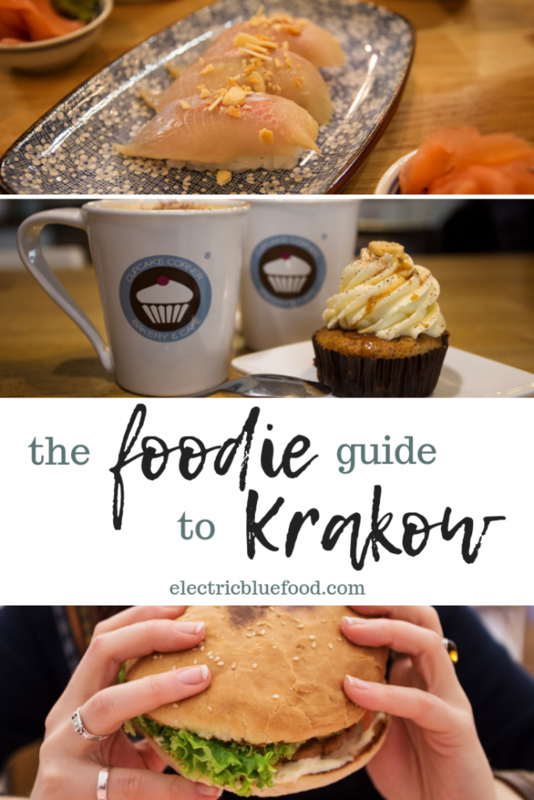 Do you have a day to spend in Krakow and don’t know where to eat? Follow me to my personal favourite eateries! The café I visited this time – which is the one closest to my house, and also the very first that opened – is the one on ul. Michałowskiego 14. 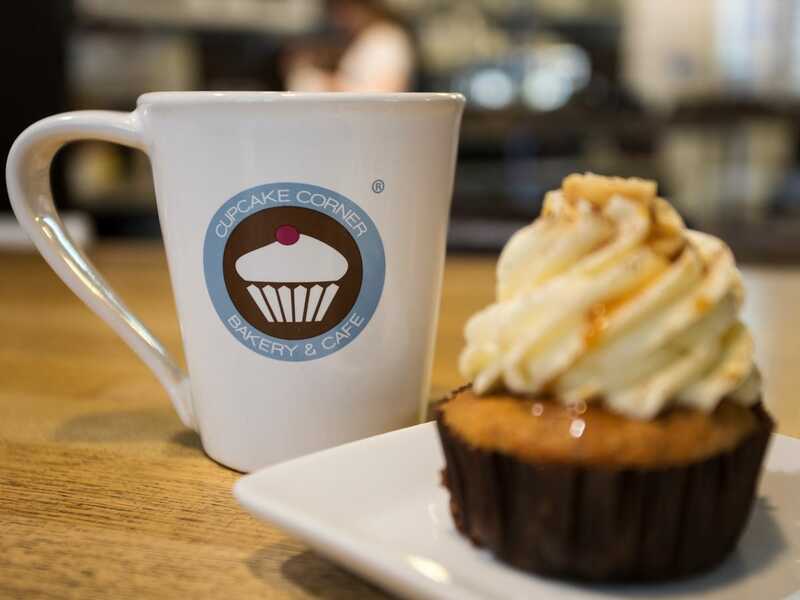 Cupcake Corner started as a cupcake place and then expanded its selection of products to various types of organic tea and coffee, milkshakes and even their own ice cream. Besides from working as a café they also cater. 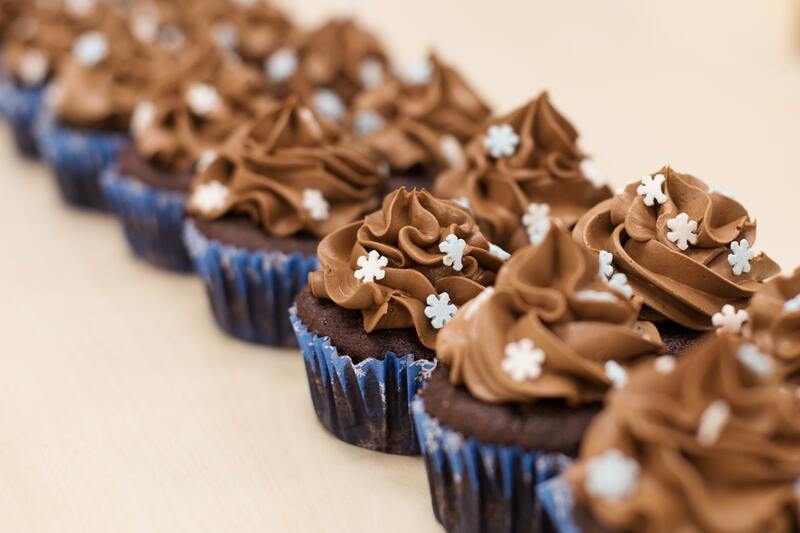 I am such a huge fan of their cupcakes that I never buy anything else when I enter one of their cafés – I just want cupcakes. My favourite is the peanut butter one, followed by red velvet and caramelised apple and salted caramel (pictured below). Oh, and coffee, of course. 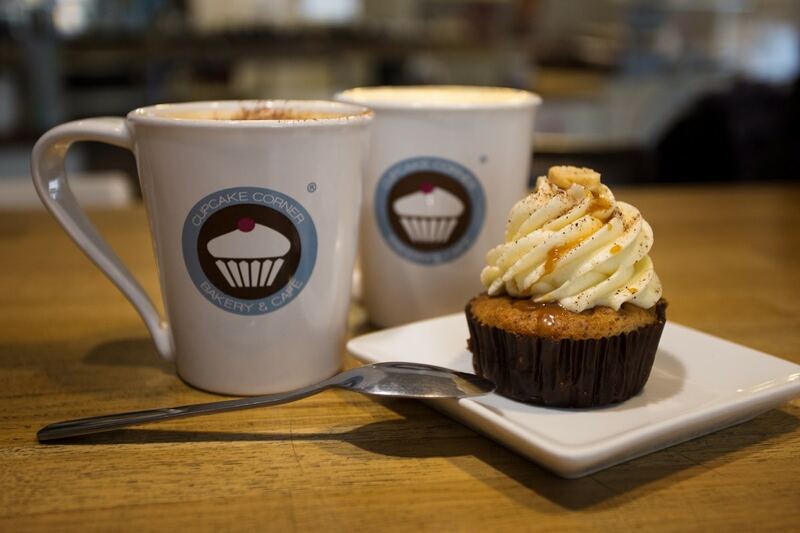 Nothing like a velvety latte to go with your cupcake. 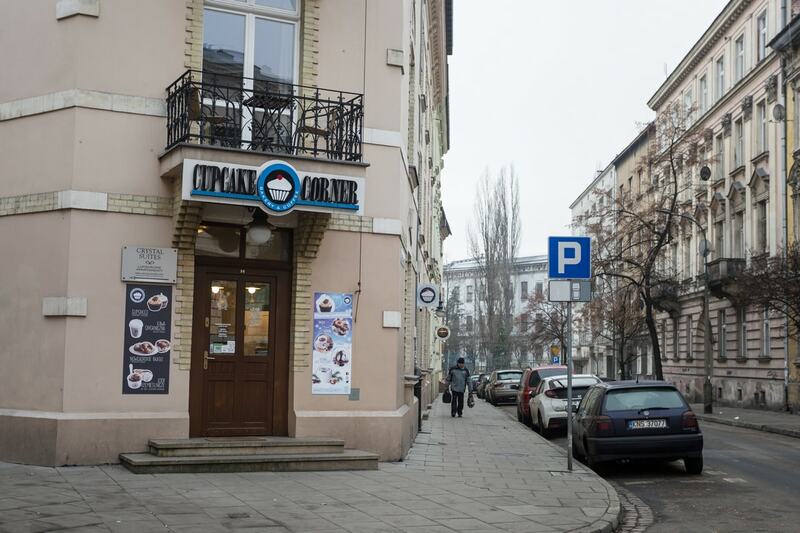 Being Italian I like to have my breakfast sweet, so Cupcake Corner is definitely the place to start the day for me. Moaburger is in the very heart of the old town: ul. Mikołajska 3. 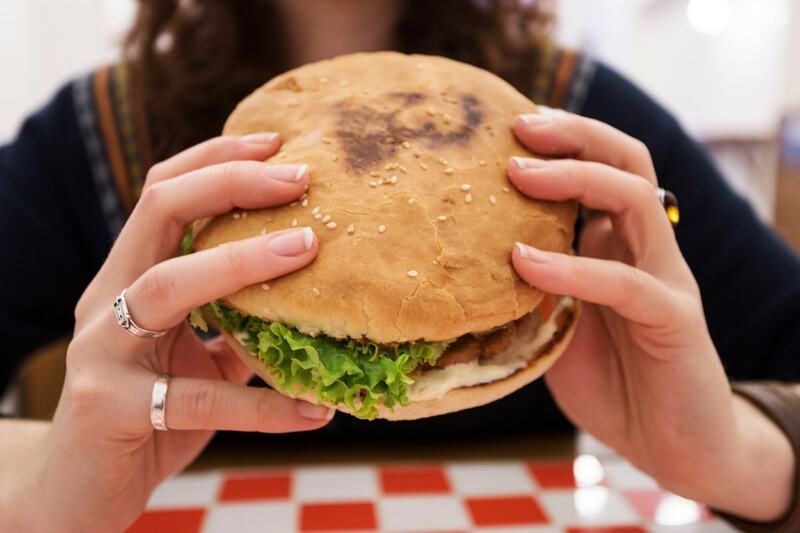 Moaburger is the place to go for authentic New Zealand style burgers and their varied menu includes beef, chicken, lamb and vegetarian. Their burgers are huge, they all feature at least 5 ingredients and in my opinion they have the best quality-price-ratio in town. 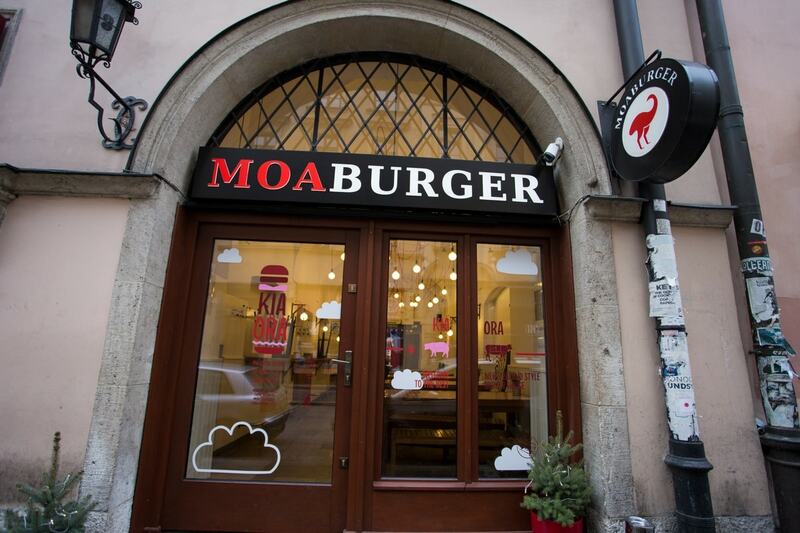 I have tried several other burger places in Krakow and Moaburger is the one I kept going back to. It was my boyfriend who introduced me to this place. He started being a customer there before I even came to Poland and met him, and then took me there to eat when we started going out together. My favourite burger? 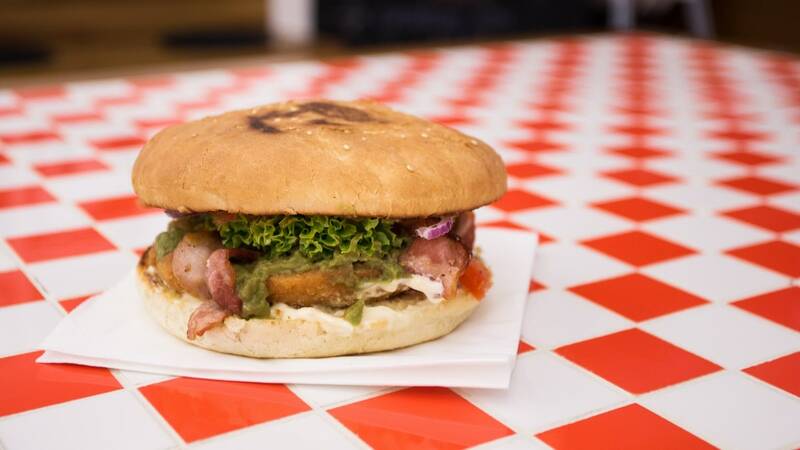 Without hesitation the “avocado chicken bacon” (pictured)! It also features lettuce, onion, tomato relish and mayo. You can grab your burger to go or eat there. Given the size of the burgers I’d recommend eating in, which will also give you the chance to enjoy the place’s nice décor. Find Youmiko on ul. Józefa 2, in the Jewish quarter Kazimierz. The bar is very small, so I recommend visiting out of “regular” eating hours in order to find a place to sit. Youmiko is different from any other sushi place you know – unless you have tried the real thing in Japan, I guess, but I haven’t (yet). 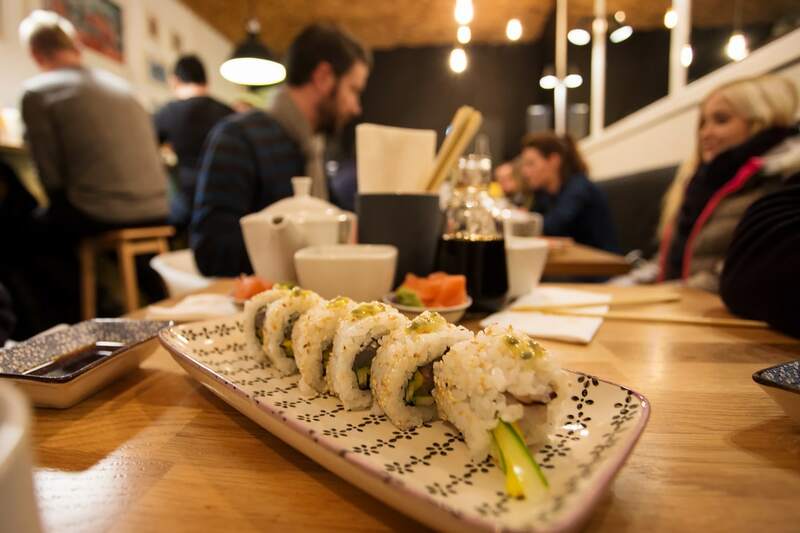 If you are experienced with the typical European sushi place, you will find Youmiko different. Forget about choosing the ingredients and forget about getting everything you order in one go. If you choose one of the okimari menus you just sit down and they will do the rest. 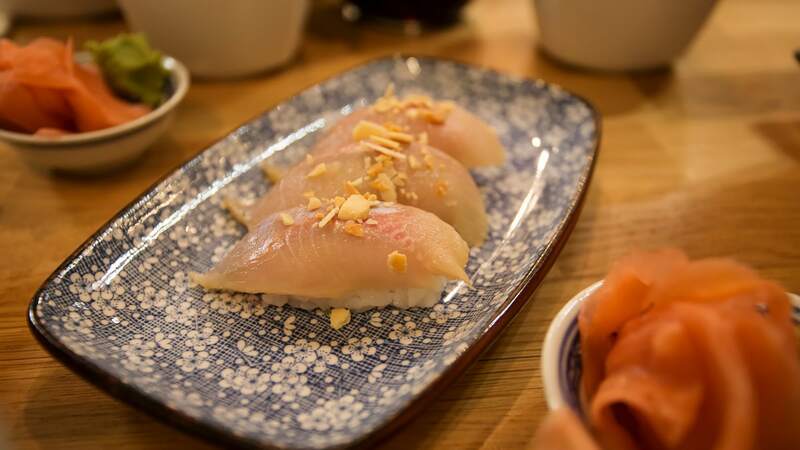 Your sushi pieces will come little by little, made on the spot, with whatever is the freshest ingredients available each day. I remember finding it slightly odd the first time I went there, as I was used to ordering what I want and not letting the chef do the pick. I was also surprised that my sushi bits were coming on small plates little by little. Two with one filling, then four with a different filling, then another two and so on. Little by little I was starting to appreciate the slower tempo and the surprise every time the waiter came with more. 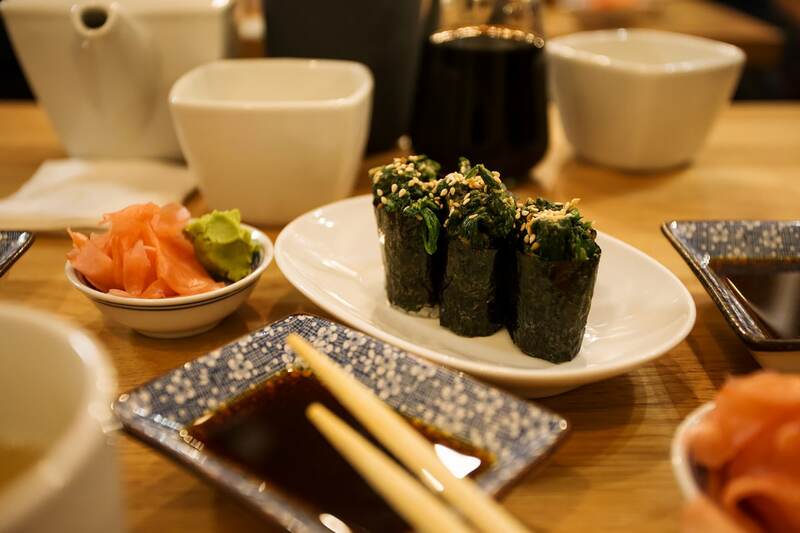 I got to sample sushi I would have never ordered before – spinach and miso paste, trout or Baltic seabass to name some (see pictures below). 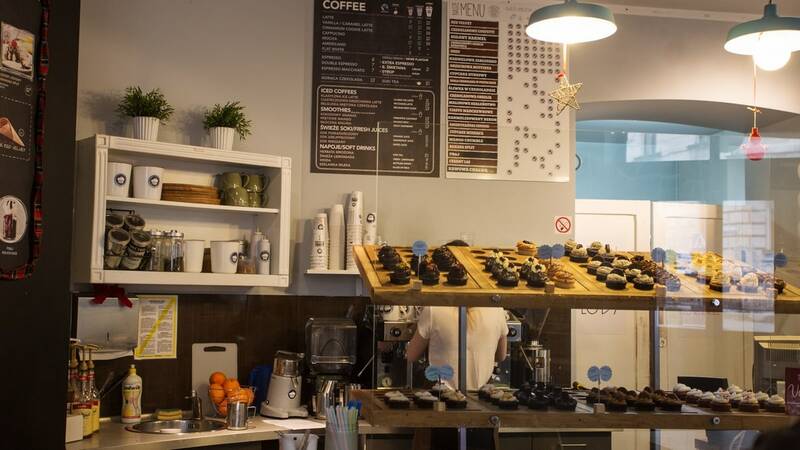 Which totally made sense, being the restaurant located in Poland – fresh and local is the key. What made me come back over and over? The devotion you can see in the sushi making process. Food must be made with love and the guys running Youmiko definitely love their sushi. I love it, too. 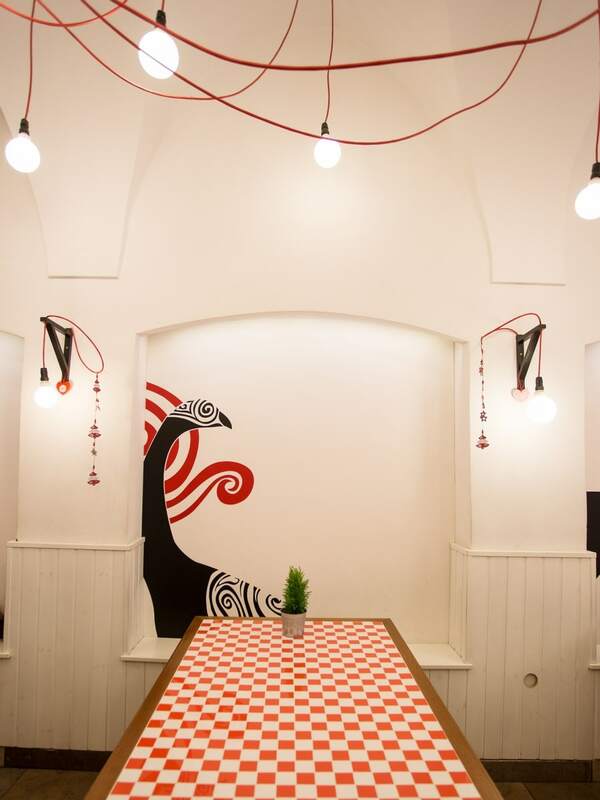 Find this Georgian restaurant in Kazimierz, on ul. Dietla 33. This is not the only Georgian restaurant in town, but it is hands down the best. I have been a huge fan of Georgian cuisine ever since I moved to Krakow, and my appetite for Georgian food grew even bigger after I visited the country in 2013. After tasting the food there, I can confirm that Smaki Gruzji in Krakow truly delivers an authentic culinary experience of what Georgia can put on your plate. This restaurant prides itself with a true Georgian chef and the most exquisite Georgian hospitality is reflected in their service. My food of choice? Badrijani (eggplant rolls filled with spiced walnut paste, pictured below) as a starter and khachapuri Adjaruli, the typical Georgian bread stuffed with cheese in the style that comes from Adjara, with a raw egg on top (also pictured). 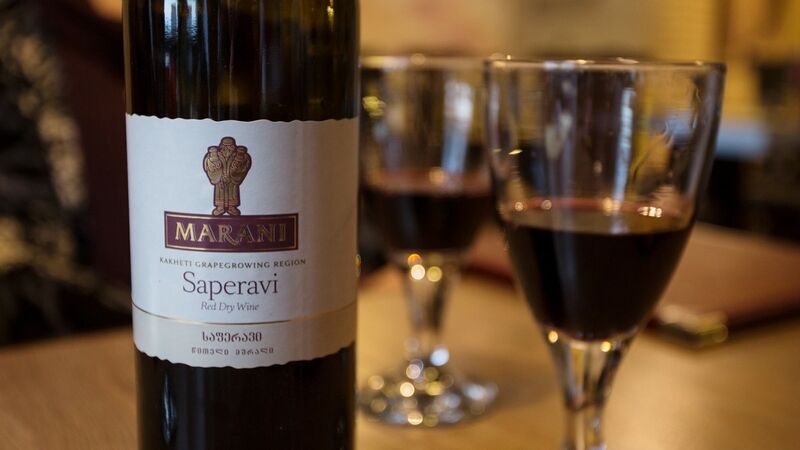 Don’t forget to order a bottle of Georgian wine to your dinner. Georgia is a country blessed with the perfect climate for wine, and at Smaki Gruzji you will definitely get to taste some from their selection. Your dining experience will be so memorable you’ll leave the restaurant expecting to hear the waves of the Black Sea in the distance. 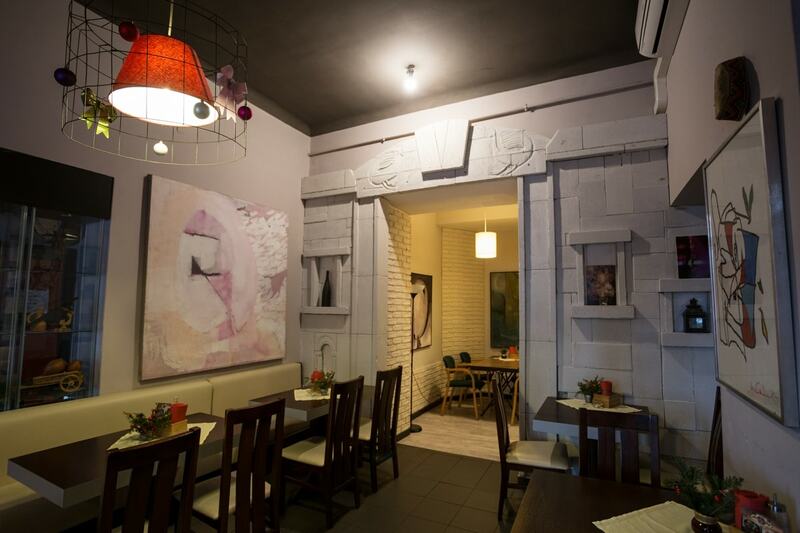 Omerta is also located in the Jewish quarter, on ul. Kupa 3. 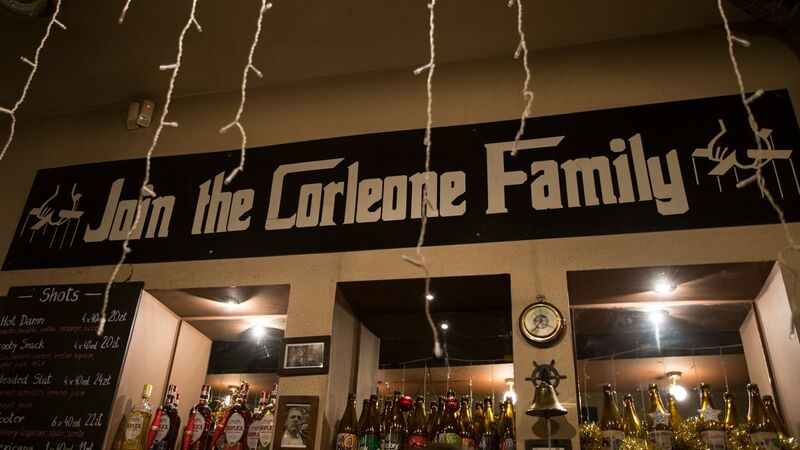 As the name suggests (although the Italian spelling would require a diacritic – omertà), Omerta pub is one big tribute to The Godfather. The pub is also one fine display of tap beer, featuring 27 taps. Half of their selection is always Polish, and half is of foreign import and varies periodically. 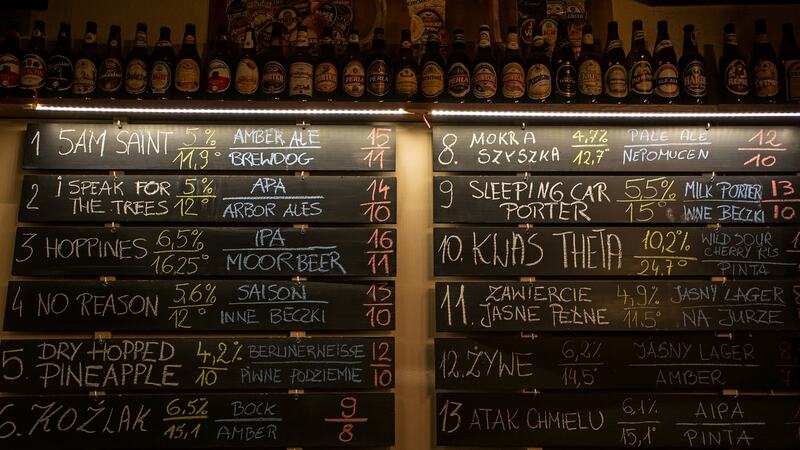 Unsure of which beer to choose? Ask the bartenders for advice based on your taste. They’re always very helpful and will be willing to let you try a little sample before filling up your glass. 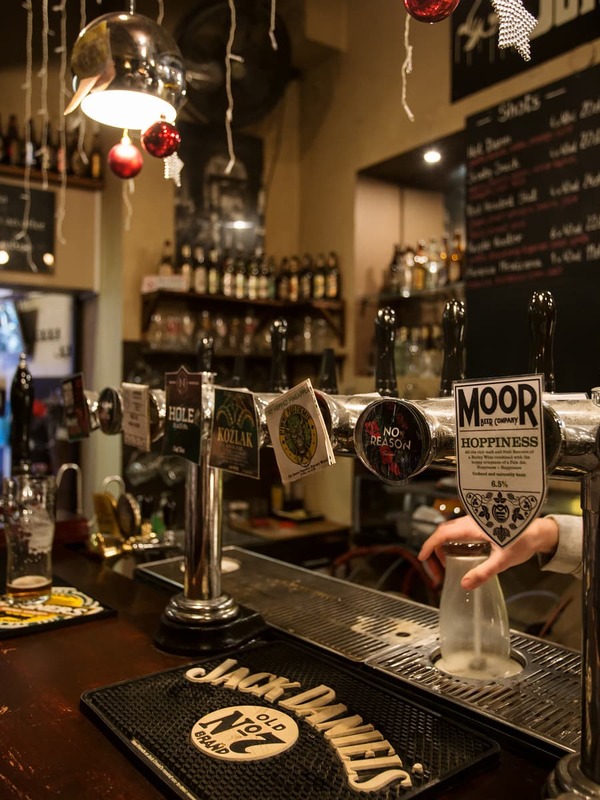 You want to be sure you’ll enjoy your pint, there’s nothing sadder than to regret what you just bought when you had such a large selection – something that the staff at Omerta would never want from their customers. 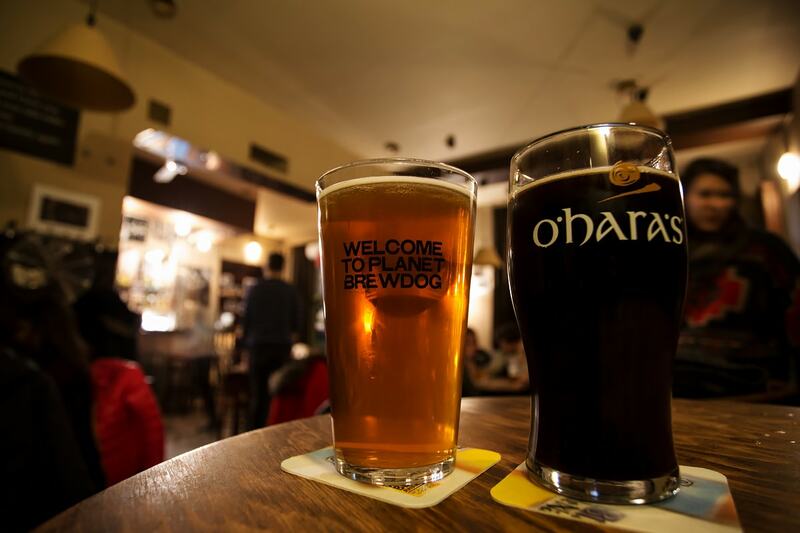 So grab your glass, sit down and enjoy some of the finest beers you can find in town. Before you leave, make sure to try at least one foreign and one local! 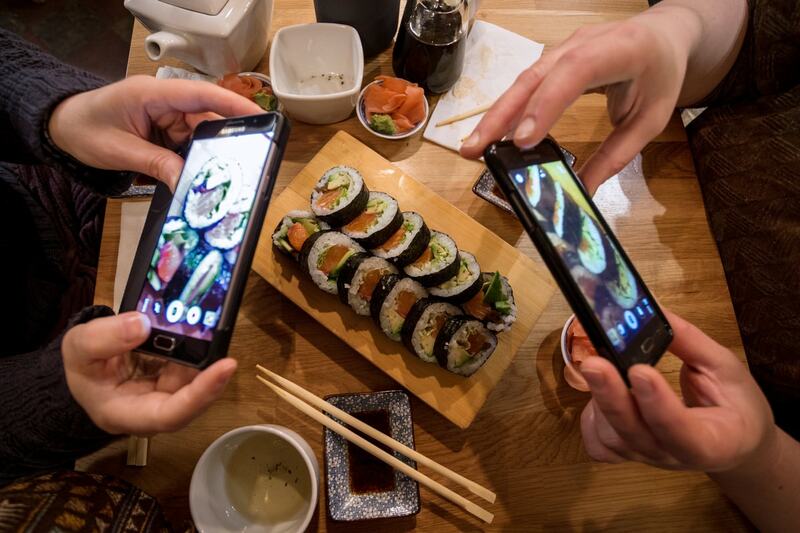 The special guests in this post, whose hands are pictured photographing sushi above, are my mom and my aunt, who joined me in this foodie adventure. Welcome to Krakow and enjoy your meals! Looks great! Thank you for the recommendation! Hope to be there someday <3 Buon Anno cara! Do it! On your next trip to Italy squeeze in a Ryanair weekend to Krakow, you’ll love it! Buon Anno Nuovo anche a te!!!! I can imagine. Would love to meet you .. cheers! 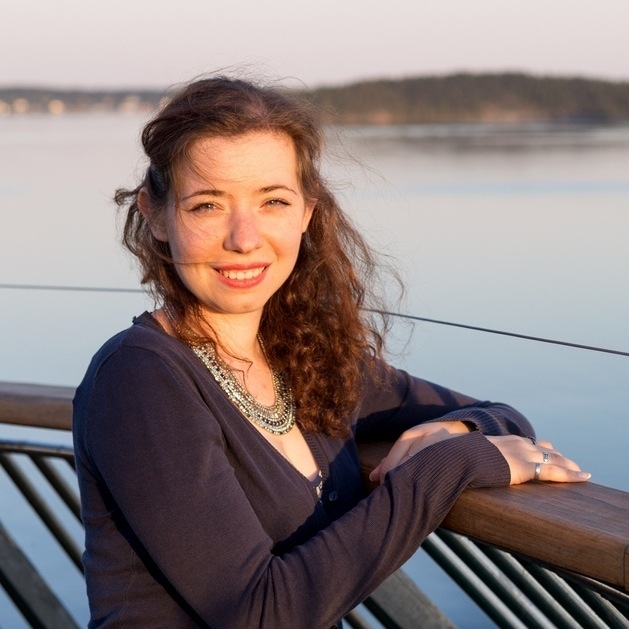 Would love to meet you too! You had me opening another window and typing in easyJet before I even read halfway down the post. I sooooo want to visit Krakow one day. 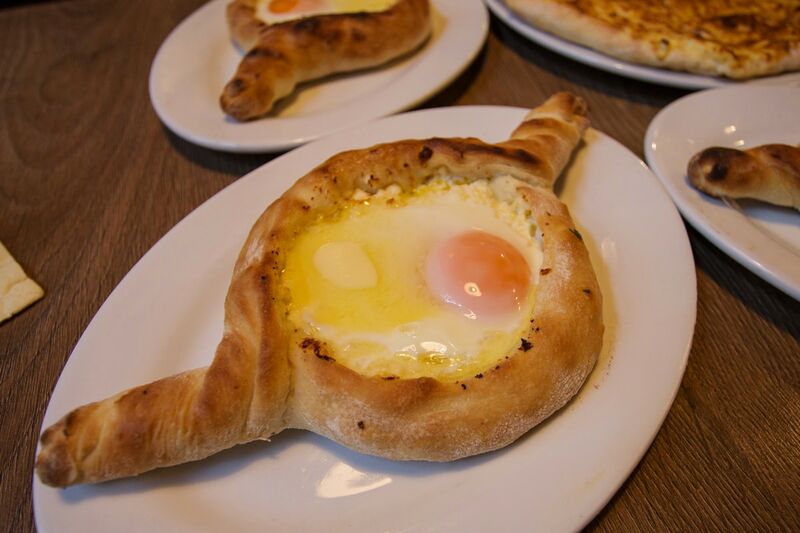 That khachapuri Adjaruli is so interesting! Have fun! Although I guess you may want to sample some Polish food, too… Next time I go there I’ll visit (and feature) my favourite Polish eateries. I just couldn’t eat out too often this time, especially considering all the food we had at home over the holidays. 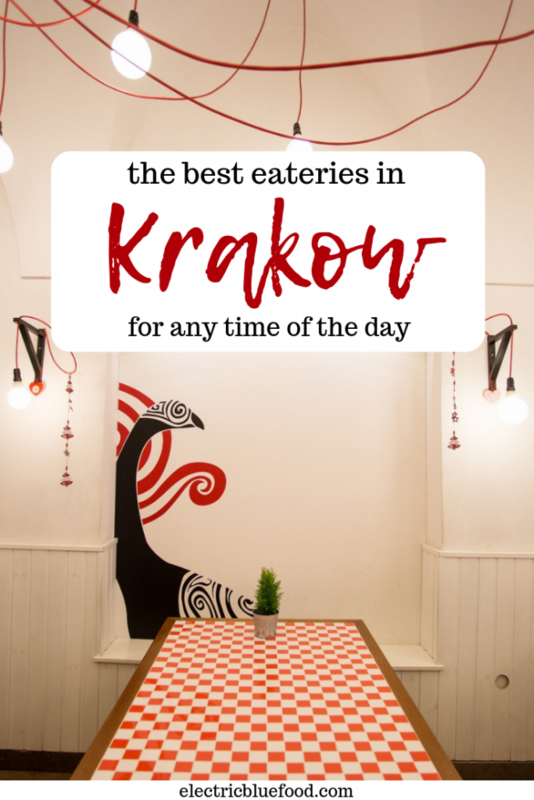 I have a few suggestions when it comes to Polish restaurants too, if you’re interested, so just ask 😉 When are you planning to go? 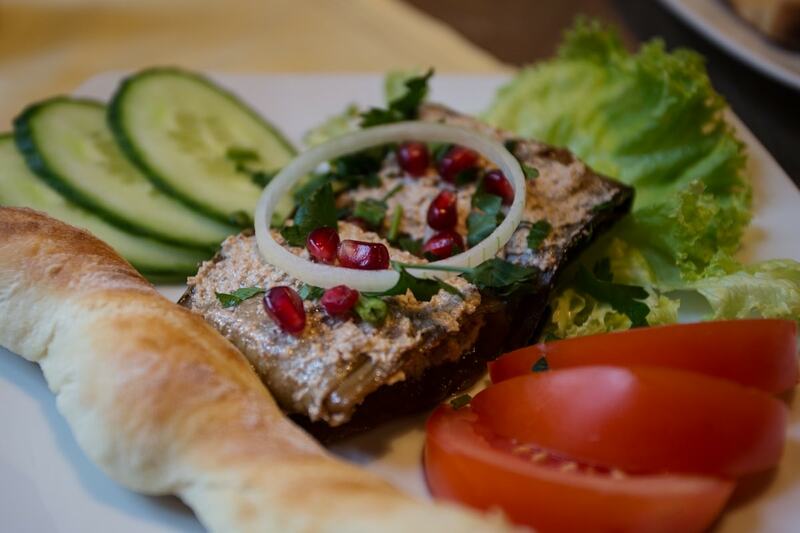 Vegetarian is very difficult, given the importance that meat has in Polish cuisine. But you can find something. Some types of pierogi that have no meat in the filling, like cheese and potato (pierogi ruskie) or mushroom and cabbage. Vegan is way harder. Even when you manage to find no meat, you will be overloaded with cheese and eggs 😀 if you’re not looking into strictly Polish traditional, I would recommend Alchemia Od Kuchni. They have vegetarian and possibly also vegan stuff. I know that some vegan bars have opened recently, so you will surely not starve. But if you go there look into Alchemia, it’s really really worth it (didn’t make it to my post because I didn’t have any more meals to feature, but it’s also a favourite place of mine). Hello GLT sister and thanks for stopping by! Yes I have been to Berlin, but only for a weekend so I didn’t really explore all the food possibilities that city has to offer. I can only imagine the variety of restaurants one can sample there! What was your favourite? Cheers from Sweden! I am so sorry to hear that, but ending up in the wrong restaurant is something that can always happen. I hope it did not ruin your impressions of that beautiful town! Great post…I’m hungry now! My friend Ewa is from Poznan and wants to travel there so she can show me her city. I would love to visit Poland one day! I haven’t been to Poznan but I heard it’s incredibly cute. I’m sure the food there is great, too! I really hope you get to visit, especially since you’d have a local to show you around! Hi Alice! That’s good to hear, I’ve only been to Warsaw twice, but if life will take me there again I’ll make sure to check it out! I love getting foodie recommendations, those are my favourites things to see when I go somewhere! Thanks for stopping by! Thanks so much for your unique post. It’s not often I come across such well-described recommendations. Thank you for your kind words, it’s a pleasure to see my work is well appreciated.